There’s no doubt that the terms content marketing and inbound marketing are the terms du jour. Google Trends shows both phrases have enjoyed a sustained and steady increase in search interest over more than a decade — with content marketing clearly in the lead. How widespread is interest in content marketing? 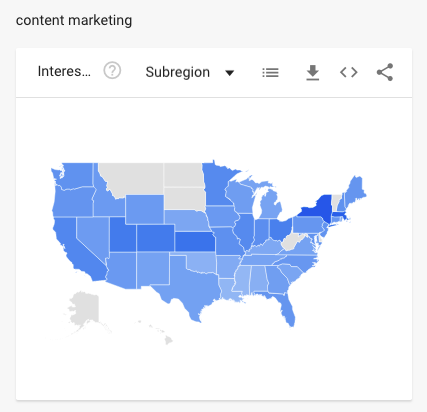 With few exceptions, Google Trends indicates interest in content marketing is consistent and widespread across the United States. Inbound marketing is focused on using the internet to attract leads to your business. 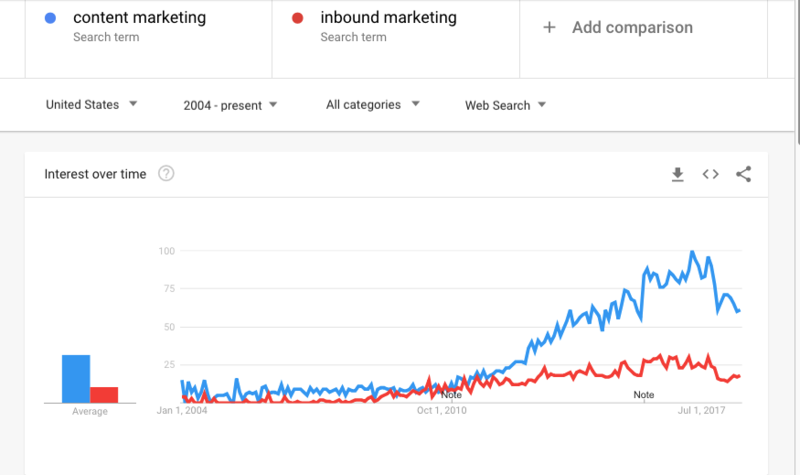 Inbound is often contrasted with outbound marketing, which is described as intrusive and using only traditional channels such as print, direct mail and broadcast advertising. How widespread is interest in inbound marketing? 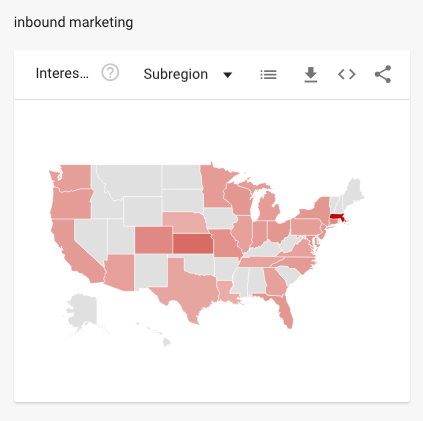 Note that Google Trends shows a significantly lighter interest in inbound nationally with a concentration in the Massachusetts area (home of HubSpot) and pockets clustered in software / technology regions. Which Approach (and Which Term) is Best for You? Some marketers use the two phrases interchangeably, and arguably, in practice the two approaches are often indistinguishable now. But there are times when using one or the other term can work harder for you. Here are some tips to help you decide. If outbound, interruptive, traditional advertising is common in your field, then inbound marketing can sound like a fresh and appealing option to your team. If your organization is still a reluctant marketer, the well-established education focus of content marketing can be most comfortable. Content marketing is commonly seen as focused on customer retention and satisfaction, whereas inbound marketing is seen as skewing towards sales and lead generation. Your business priorities may make one or the other term more appropriate at this point in time. If you have a board member enamored with the term inbound marketing, go with it. If you have a board member enamored with the term content marketing, go with it. 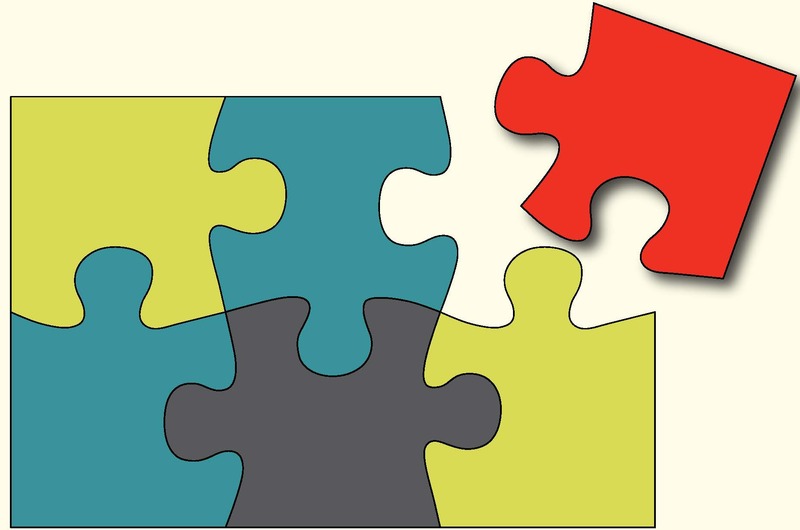 The answer to the puzzle of whether to use the term content marketing or inbound is that there is no one right solution. Unless there are others around you who care, use either – or neither – phrase. Don't let the jargon and terminology get in the way of the power of effective marketing to advance your mission. Effective marketing is focused on your audience and their needs and presents information in the manner and channels they prefer — or more simply — it focuses on who, what, where to communicate.